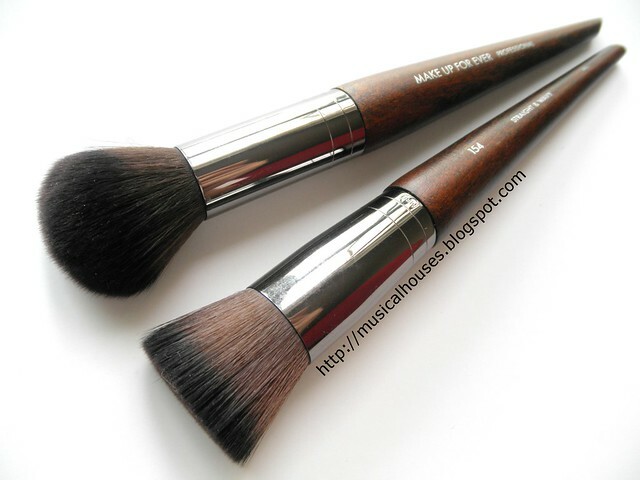 Along with the MUFE HD Second Skin Cream Blush that was launched recently, MUFE has also launched a set of makeup brushes, which I thought deserved their own post, because these are some really standout makeup brushes! One of the really standout features of these new brushes are how soft they are. When I heard that these were made of synthetic bristles, my first thought was, "Aren't all these synthetic-bristled brushes the same? They all feel the same to me!" And I learned that these are made from a different material. Your regular synthetic-bristled brush is made out of nylon fbers, but these are made out of a special type of material that's proprietary (so although the science geek in me was trying to annoy the PR staff into telling me what the material was, it turns out that they didn't know exactly either) and unique to MUFE at the moment. So these brushes are indeed something unique! MUFE's new brushes utilize a new synthetic fiber that makes their brushes softer than the typical synthetic brush. Almost all my synthetic-haired blush and highlighter brushes, for the sake of comparison! The first thing I did with all these brushes was feel the bristles, rub them on my face and neck, and try to arrange them roughly in order from "least soft" to "softest". And this was the order I came up with. Like I mentioned earlier, most synthetic brush bristles are made of nylon fibers, so I wasn't at all surprised to see that pretty much most of my brushes felt and performed about the same in terms of bristle feel and softness. In the end, I found it more useful, rather than doing a brush-by-brush scale, to just group them broadly into three groups. This meant that there were a lot of brushes in Group 2. My synthetic blush and highlighter brushes, grouped by softness of bristle. Now I happen to be a bit of a brush quality snob (not necessarily a branded brushes snob, mind you), so I don't really have any super lousy or scratchy synthetic brushes. So even the brushes that are ranked as "roughest" are still actually quite soft. I know Real Techniques seems to be the "roughest" brush if you look at this, so I'd like to clarify (and I might want to caps-lock the next statement because I'm sure some people may not see it in the jumble of text): I'M NOT SAYING REAL TECHNIQUES BRUSHES ARE LOUSY. 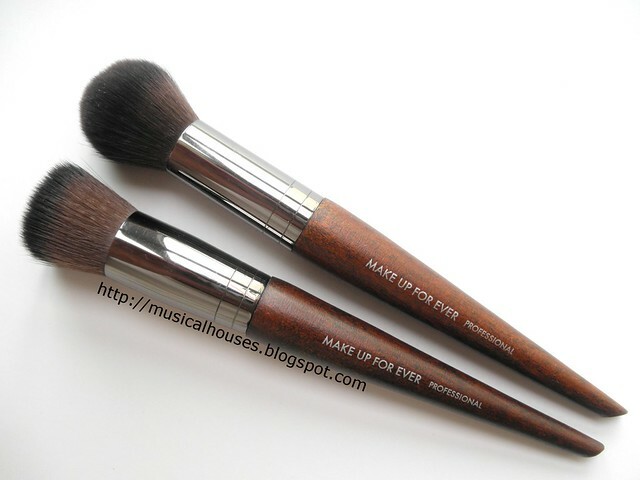 In fact, if you told me "Musicalhouses, you can only ever use Real Techniques brushes to do your makeup for the rest of your life," I'd be like, "Meh," *shrugs*, because I do like my Real Techniques brushes and I think they are great. So I don't want anyone to come away with the idea that these brushes are crap. It's just that for purposes of this excercise, I'm looking only at bristle softness (so nothing about handle sturdiness, shape of bristles, how the bristles are arranged and so on), and by that measure alone, I do find my Real Techniques brushes to have the least soft bristles. I'm not complaining though - these are really one of the more affordable synthetic-bristled brushes I own, so I'm not surprised. 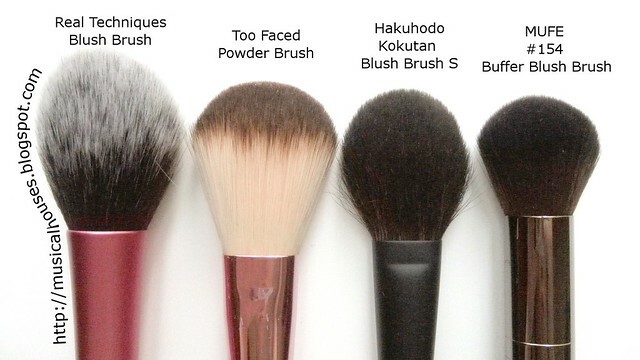 Now, you can also see from the photo above that I do rate my new MUFE brushes very highly - in fact it's right up there with my Hakuhodo Kokutan Blush Brush S. So I thought I'd pick a brush from each group and zoom in on the brush heads, so you can see them side by side. Can you see the difference in bristle coarseness yet? 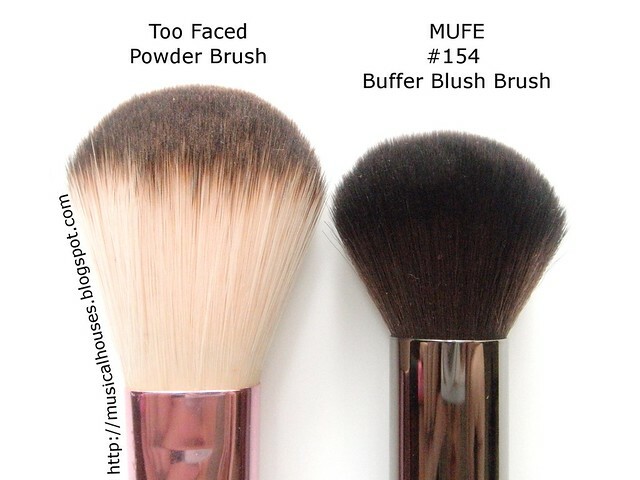 Let's take a look at a brush from Group 1, the Real Techniques Blush Brush (which I've blogged about before), and compare it to the MUFE #152 Buffer Blush Brush. As you can see, the difference in bristle fineness (and thus bristle softness) is very clear. While like I mentioned earlier, the Real Techniques brushes are great, the MUFE bristles are by far finer and softer. The difference is very apparent when I stroke my skin with them one after the other. 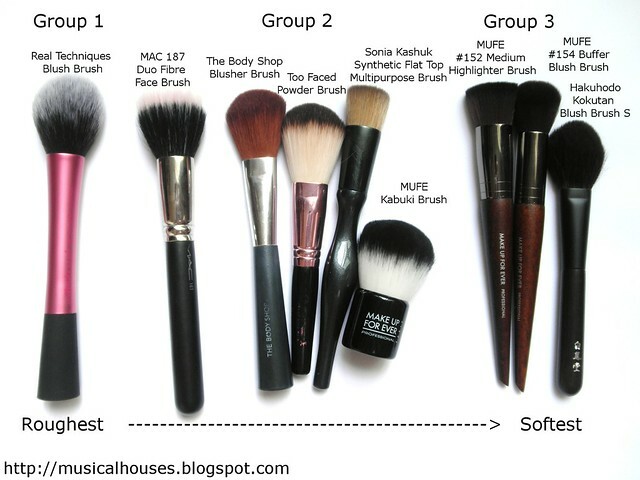 Now, a Group 2 brush, as compared to the MUFE #152 Buffer Brush. For this, I've used my Too Faced Powder Brush. The Too Faced Powder Brush is from a 5-piece set that I bought some years back. I subsequently let go of all the brushes except this, because I loved this the most. The set has been revamped slightly (different coloured handles and all), but you can still buy it. Although this is a travel-sized powder brush, I find the size and shape more suited for blush. Next to it, my MUFE #152 Buffer Blush Brush. 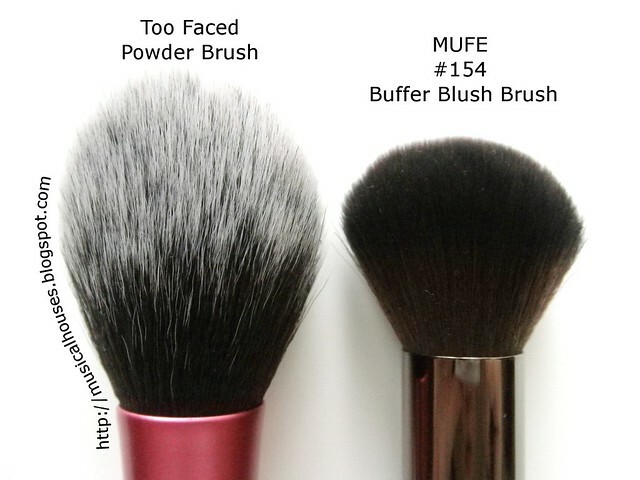 From the photo below, you can also see that although the difference is not as stark, you can see the bristles on the MUFE #152 brush are finer than that on the Too Faced Powder Brush. 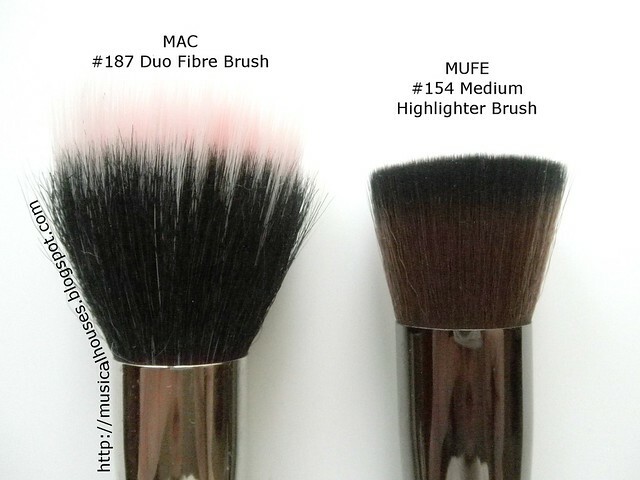 Lastly, I compared one Group 1 brush to my MUFE #152 brush. This group is where my MUFE Buffer Blush Brush falls into, and so there aren't really many brushes in this group - just my MUFE brushes and Hakuhodo brush. 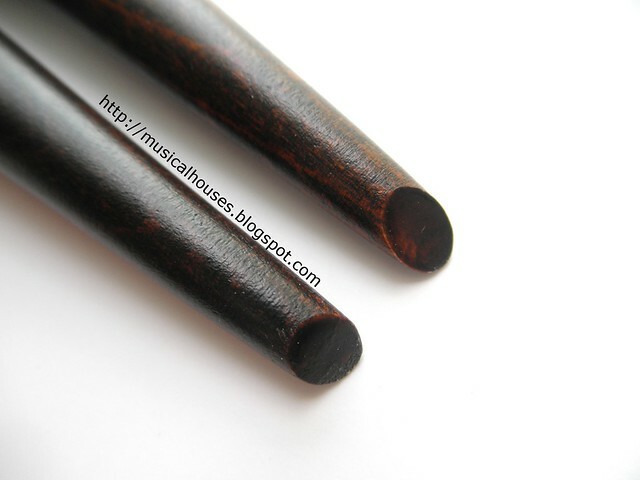 Below, you can see that there is a lot more parity in the bristle fineness and thickness. 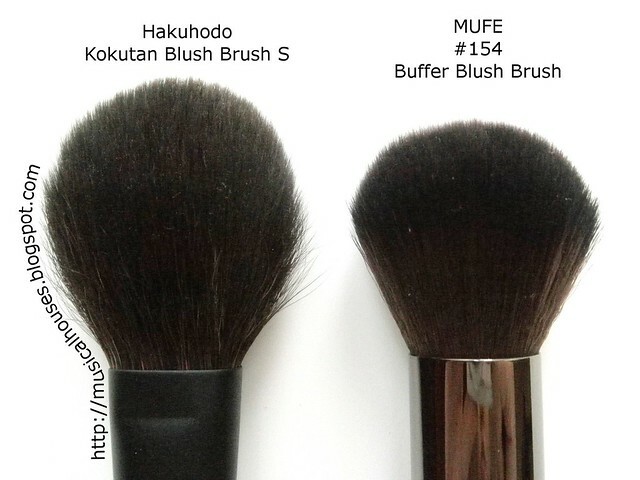 Both my Hakuhodo Kokutan Blush Brush S and my MUFE #152 Buffer Blush Brush have the same thickness and softness of bristles. Yes, I just put my Hakuhodo brush on par with my new MUFE brushes. I don't know if anyone would agree with me, but that's what I honestly thought when I felt the bristles of both. Here, you can see a "Group 2.5" (somewhere in between group 3 and group 2) brush, which is my MAC 187. I couldn't really decide where to put it - it wasn't quite as coarse as my Real Techniques brushes, yet it didn't exactly feel like my Too Faced or Sonia Kashuk brushes either. In the end, it was the lone straddler, in between Group 3 and Group 2. Next to it is my MUFE #154 Medium Highlighting brush. Here, you can see the obvious differences in bristle coarseness, and so on. I love my MAC #187, and it is a staple for applying pigmented brushes and highlighters, so I won't say it's crap, but just going by bristle softness, the MUFE wins. You can also compare a Group 2 brush - in this case the Sonia Kashuk Multipurpose Flat Top Synthetic Brush. This is actually quite a close dupe of the MUFE #154 Medium Highlighter Brush, because it has the same brush head size, bristle density, bristle length, and handle length. But the bristles aren't quite as soft as the MUFE #154 brush. I love my Sonia Kashuk Flat Top, but I'll admit that the MUFE does have softer bristles. But, if you want a cheaper dupe, the Sonia Kashuk isn't bad either. All in all, as you can tell, I have officially gone through the synthetic (and partially synthetic) bristle brushes in my stash, and I officially declare that the MUFE brushes are the softest, up there with the Hakuhodo ones I have. And they're easier to get hold of, too. I also like the little touches that the MUFE brushes have, such as the wooden handle, as well as the little slanted tip at the end of the brush. I was told that Dany made the brushes have a flat slanted end, because she noticed that makeup artists were always using the ends of their brushes for little manoeuvres, like pushing false lashes into place, mixing pigments, and so on. So to cater to such usage of the brushes, she made the ends slanted, and flat with a tip at the end. I really love such attention to detail - Dany is famous for bringing it to her MUFE products, of course, but it's always nice to see these little touches. The little details count: The flat, slanted ends of the MUFE brushes allow for little manoeuvres. So all in all, would I recommend these brushes? The answer is yes I would. They are spendy for sure, and not in everyone's budget. And as you've seen from this post, there are plenty of cheap and good options that I also have in my stash - Sonia Kashuk, Real Techniques, and so on. So I wouldn't say it's a must-have-get-it-or-be-doomed-to-lousy-makeup-application-forever kind of product. But seeing as how you can waste perfectly good money on expensive but lousy brushes, I'd say that if you are looking for brushes of excellent quality, and if your budget allows, then I would definitely recommend these. These are the softest synthetic brushes I have, and the exclusive synthetic fibres make them something very unique on the market, too. The MUFE brushes are of excellent quality, with bristles that are super-soft and unique on the market. Sturdy, good brushes with excellent bristle softness and great overall quality, the MUFE brushes are worth the splurge for budgets that can accommodate it. 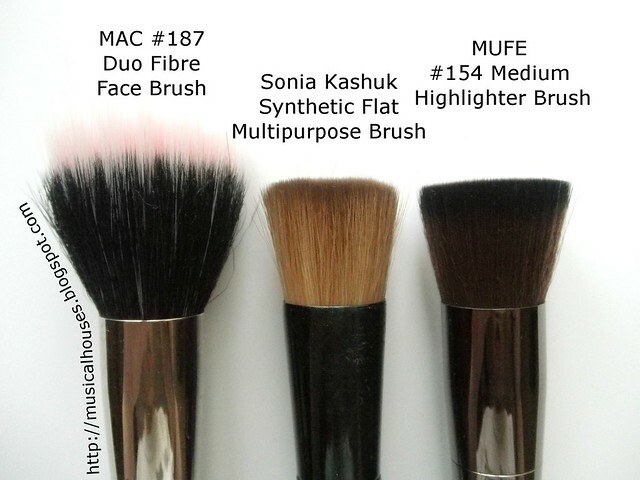 I love MUFE makeup and I would love to try the brand's brushes. I love your reviews and how you go to such lengths in detail, but I do have to point out that the pictures could be misleading b/c the "rougher" brushes also tend to have white or very light shading on the hairs. Of course it's easier to distinguish the bristles and have it appear to be sparser b/c they're easier to see vs. a dark brown/black bristle. This can be alleviated by maybe examining the darker bits to each other, but really this review requires that we solely rely on how it felt on your face. After saying all this, I do agree with your review results, but just felt compelled to point out that it's a tad unfair. @MizzJ: You're right, when looking at the softness of the bristles, the only real way to test it is to feel the bristles for yourself on your skin. But since that's not possible, I took photos of the brush heads close-up so that I can show the difference in bristle softness. 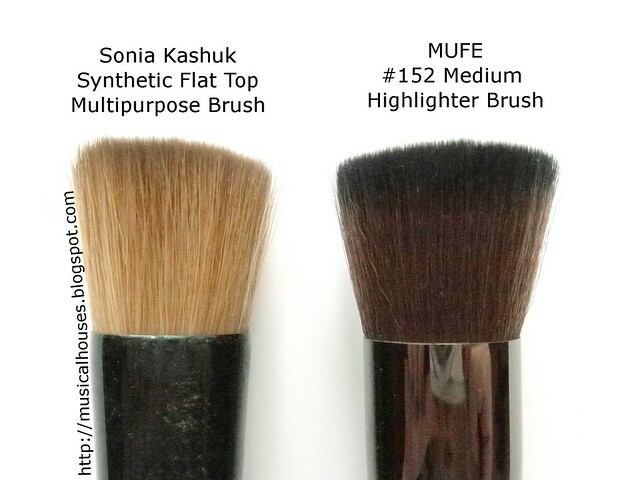 In this case, the MUFE brushes have softer bristles than the typical synthetic bristles because the material is different, but also because their bristles are finer, in this case, they would look "thinner" than the bristles in other brushes. So insofar as you can see the differences in how thin/narrow the brushes are, that attests to some of the differences in quality. I did actually try to take photos of individual bristle strands or a bunch of strands on the brush, but the photos just didn't turn out that well, and I felt that it didn't really add anything to the post that couldn't be seen from the brush head photos. But you're right, it is not as comprehensive as it can be without the ability to touch and feel the bristles. 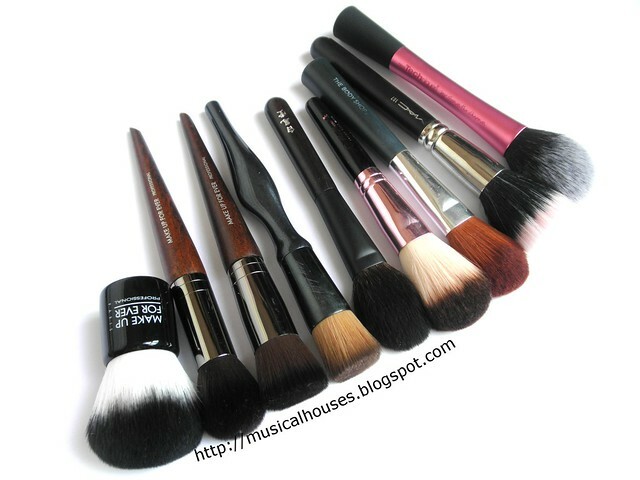 What an in depth review of the MUFE brushes, they are really very soft and I love using mine.